Vicki’s Tap Pups have always been an incredible and dynamic group that consistently surprises and ignites Central PA to rethink what dance and community is all about. And this year, they are switching things up again by throwing an incredible 50s & 60s dance party right after our Spring Show performance headlined by Vinyl Groove. It doesn’t get any better than that! $10 for children 12 & under. * This ticket is General Admission and/or Grand Stand Seating. Cash bar available. Reserve a full table for your party, or buy individual seats at a table while availability lasts. Each ticket is $45 per person. Tables range from $180 (4 Top) to $450 (10 Top). Tap Pups Show starts 4:30PM. Dance Party starts at 6PM. 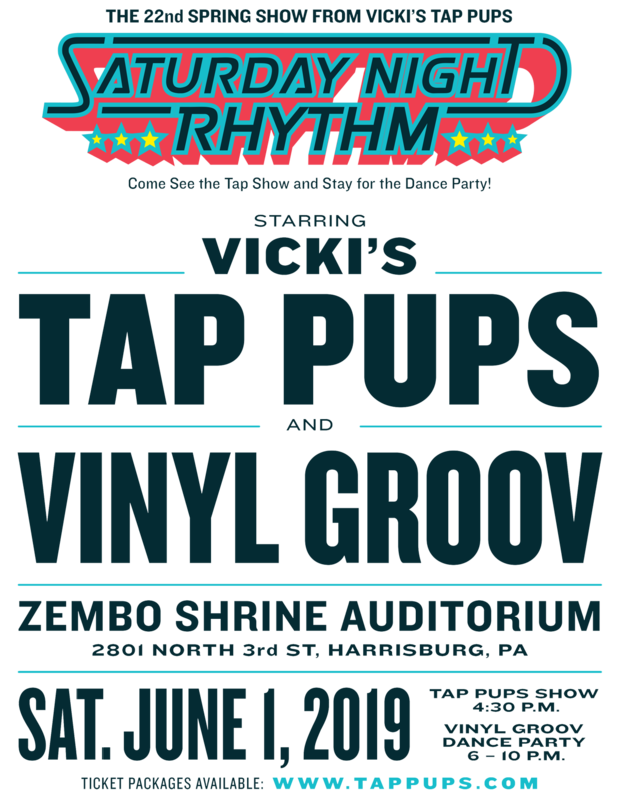 Tickets are NOT attached to a reserved table, but grand stand seating is available for the Tap Pups Show and there will be seating available throughout the venue (lobby, Tile Room, and chairs placed throughout auditorium) during the DANCE PARTY. Each ticket includes light dinner in the Tile Room starting at 6PM. These tickets are NOT attached to a reserved table there will be seating available throughout the venue (lobby, Tile Room, and chairs placed throughout auditorium) during the DANCE PARTY. Each ticket includes light dinner in the Tile Room starting at 6PM. Doors open at 6PM and ticket holders will not be allowed past the lobby before then while the Tap Pups Show is in progress. WILL THERE BE HANDICAP SEATING? IS THE DANCE PARTY FOR ADULTS ONLY? Yes, the Dance Party is only for adults 21 and over. But, of course the TAP PUPS SHOW is for ALL AGES. WHAT IS THE RESPONSIBILITY OF A TABLE CAPTAIN? Each table needs 1 table captain to ensure a reservation. The table needs to be pre-paid for in full to reserve, and the table captain sells the seats to their friends and family. If you need help filling any remaining seats, Vicki’s Tap Pups will try to help sell the extra tickets if there is a waitlist. WHAT’S THE DEAL WITH FOOD AND DRINK? A cash bar will be open DURING the Tap Pups show until the end of the Dance Party, and Food will be served in the Tile Room starting at 6PM until it’s gone. Food will ONLY be available for Dance Party ticket holders. HOW WILL THIS YEAR’S TAP SHOW SHOW BE STRUCTURED? The overall energy of this show will be like a sophisticated and glossy pep rally-style performance where all the Tap Pups will be present, watching and cheering on each of their fellow dancers. There will be no introductions or videos, just back-to-back tap dancing with a really fun and personal attitude – with bright lights, red lips, gold hoop earrings and killer sequin jackets! WHAT HAPPENS AFTER THE TAP PUPS SHOW? After the final bow, all friends and family can come down to the main floor to hang out with their favorite Tap Pup before everyone moves to the Lobby and Tile Room (located off the Lobby) for food and drinks. The auditorium needs to be cleared out by 6PM so VINYL GROOVE can get set up and do their final sound check. Auditorium doors will reopen at approx. 6:30PM and Vinyl Groove starts playing at 7PM. See America’s Largest Adult Tap Studio in Action!